Like other hardwood trees, there are two kinds of wood cells: wood fibers and vessel elements. The wood fiber cells continue to grow a secondary cell wall of cellulose, hemicelluloses, and lignin, squeezing the living protoplasm and nucleus to the center of the cell until the wall is very thick and strong, and then the cells die. The vessel elements provide the transportation network for the oak tree's sap. Only in the outer layers of the vascular cambium do the phloem cells function in fluid transport. 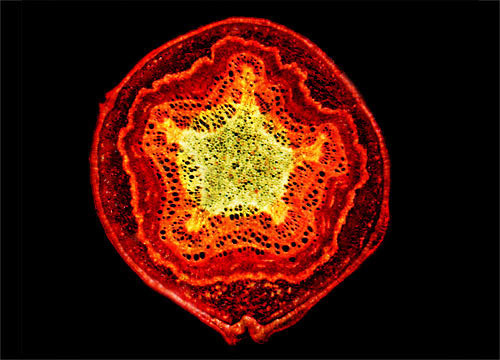 With growth, the older phloem cells are squeezed and lose function. As the tree ages, the oldest xylem cells become dead parts of a living system (like human fingernails and hair), and become theheartwood, the darker wood at the tree's center. Heartwood cells add strength and structure with their tough, fibrous mass and allow the oak to reach its tall and massive stature. The sapwood, the lighter wood, accounts for the annual rings that foresters use to estimate the age of an oak tree. The summerwood (higher density cells) form the growth rings while the springwood (the low density cells) form earlier in the year.